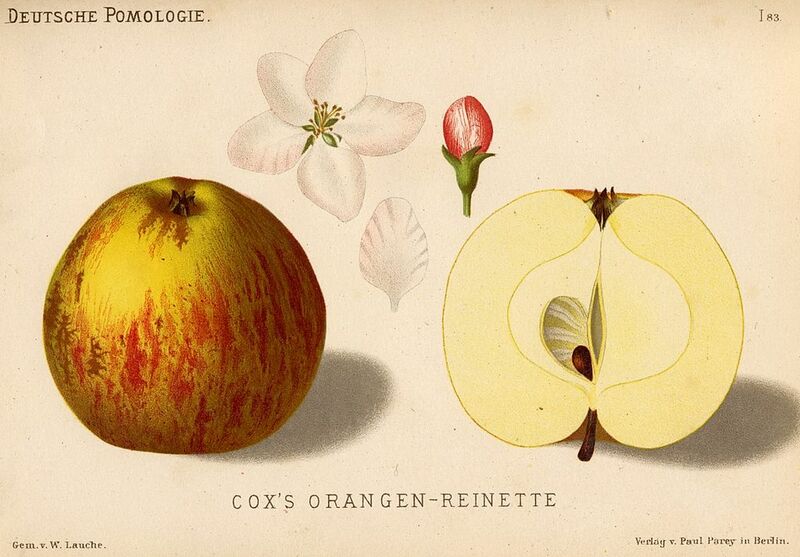 In 1892 you could purchase over 700 apple cultivars from commercial nurseries in the United States. By the nineteen-sixties you could most likely find only three varieties in your grocery store: McIntosh, Red Delicious, and Golden Delicious. Many popular and prize-winning pome varieties are now lost forever, including hundreds of well-documented varieties. While I tend to wax perhaps hyperbolic concerning this incredible fruit, we are, at least, currently enjoying the dawn of a new golden age of apples, due in no small part to the efforts of conservators and pomologists over the past fifty years who have worked patiently and creatively to undo the damage that globalization wreaked on the mighty apple – at once the humblest and the most emblematic of all fruits. Before refrigerated transportation in the early twentieth century, apples were a local affair, and consequently far more interesting and varied. Apples for eating were available when they were in season and regionally. Most apple-producing states boasted fifteen to twenty chief varieties. While Rome commanded Ohio, Empire ruled New York. Shapes from round to oblong to conical, smooth and bumpy, colors red and green and speckled on the outside, and pale or pink or red or green or ribboned on the inside. Mottled, russeted, sweet, tangy, or tasting of rose, banana, pineapple, berry, or nut, regional apples were a triumph of diversity and growers’ pride. When technology allowed apples to be shipped thousands of miles away from the originating orchards, a new set of commercial demands arose that literally reshaped the apples for a wider market. In the first half of the twentieth century, farmers, responding to the needs of the larger and more profitable markets, artificially selected for propagation only varieties that were extremely durable, uniform in shape, as large as possible and deep in color. A king was born: Red Delicious. Unfortunately, taste was not an attribute in which this variety excelled. On a personal note, I would add here that I have had a good crispy, sweet Red Delicious apple on occasion, but mostly I find them bland and either mealy or grainy in texture. And I haven’t done enough research to know whether an apple growers association or the like was instrumental in promoting only specific varieties, or if word simply spread through the apple grapevine (as it were! ), but in any case, by 1980 little else was available on the American market. Orange Pippin – a worldwide apple registry with information on over 600 varieties and over 2000 orchards including user reviews and photos. List of Apple Cultivars – from Wikipedia, the free encyclopedia. Adam’s Apples – an amateur explores the pomaceous fruit.